Blyth Spartans manager Tom Wade. Tom Wade is determined for Blyth Spartans to put the ‘horrible’ disappointment of last season behind them – and he believes his recently bolstered squad can do just that. Despite finishing on 99 points in 2015-16, Spartans missed out on automatic promotion to Darlington 1883, and then lost their play-off semi-final to Workington by the odd goal in seven. Wade believes he has identified the reason why Blyth fell agonisingly short. 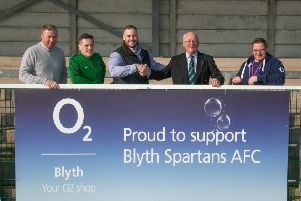 “Last season we didn’t get promoted in my opinion because of the squad – we didn’t have a deep enough squad,” said the Blyth Spartans manager. “This season, if we can keep a hold of everybody, we will have an unbelievable squad. Wade described the play-off defeat as “probably the worst feeling I’ve felt in football all my life”, but believes that the latest signings – including former Gateshead midfielder Matty Pattison and returning duo Jarrett Rivers and Matthew Wade – can take Spartans to the next level. He said: “Pattison is top drawer. Him and Stephen Turnbull, they never give the ball away. “Rivers looks sharp as anything. I know he’s carrying a bit of a knock, but that was his first game in four or five months and he looked sharp. Two of the club’s younger signings, Luke Armstrong and ex-Blyth Town forward Zat Atkinson, also impressed the boss whilst on trial at Croft Park. The former was described as “obviously quality … very sharp and very quick”, while Atkinson, a regular on the scoresheet for Blyth Town last season, is considered “one for the future” by his new manager. “They are two very young, fast, hungry players, which is what Blyth are all about,” added Wade. Spartans have lost just once in their seven pre-season outings – a 3-0 defeat to Gateshead at Croft Park – and put seven goals apiece past Ashington and a Franco-Portuguese XI. “It could have been harder, but unfortunately we had some games fixed up and then some cancelled, and we cancelled one ourselves,” admitted Wade. With the side’s league campaign kicking off in ten days’ time, Wade is optimistic about their chances.